Metro: None, perhaps Spagna. An alternate is to take Bus 40 or 64 (get off at Piazza San Panteleo, 2 stops past Piazza Venezia, then walk 2 blocks south from there). The fountain at the western end of Piazza Campo di Fiori is a copy of The Fountain of Tureen without the cover which was made in 1898. This is the fountain in my photo. The Fountain of Tureen is shaped like a long oval serving dish with a domed cover. It was designed between 1572 and 1585, and the lid was added in 1622. The fountain was built at the center of Piazza Campo di Fiori but was dismantled in 1889 to make room for the monument to Giordano Bruno. The new fountain was created in 1898 while the Fountain of Tureen was in the storerooms of one of Rome's museums. In 1925 it was relocated to Piazza della Chiesa Nuova. 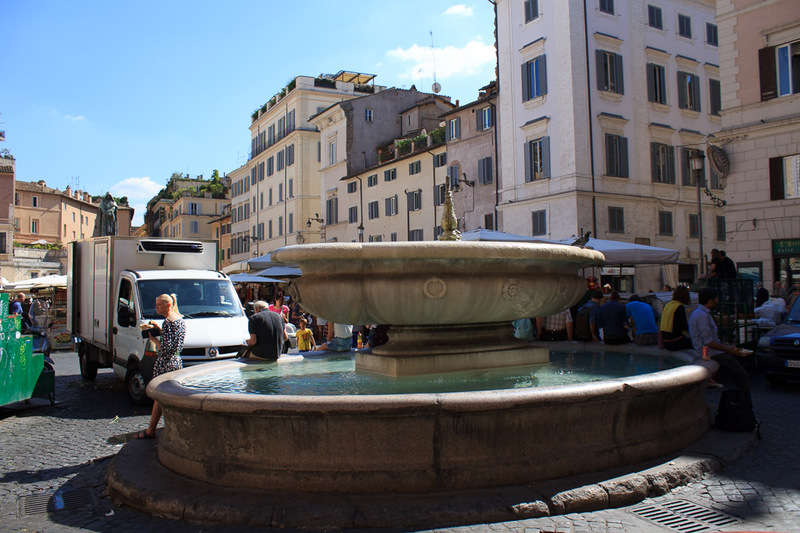 See all Fountain in Piazza Campo di Fiori photos.